Pour liquid fabric starch into the bucket and shred a pile of newspapers. The amount of newspaper needed will depend on how many pieces of fruit you're making. Shred enough to fill a mixing bowl and be prepared to shred more, if needed. Place a round, inflated balloon on a flat surface covered by an old towel. Dip, one at a time, shredded newspaper pieces into the liquid fabric starch and stick the wet paper to the balloon. Cover the balloon. For any shaping in addition to the round shape, layer the paper to create the bulk. For example, for a green pepper, layer two bumps like the two top parts of a heart, on top of the round balloon. You will need many layers to build up the needed bulk. Do the same for apples. Allow to dry. 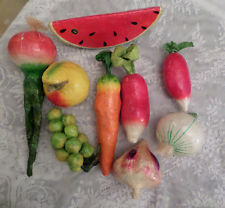 Paint the fruits/vegetables according to how they should look, using paints and paintbrushes. Add details such as the navel of an orange, or the brown circle where the stems attach to tomatoes. Cut a small circle from felt and glue to the end of the tomato, or cut a small, felt rectangle for an apple stem. Pour liquid fabric starch into the bucket and shred a pile of newspapers. The amont of newspapers needed will again depend on how many pieces of fruits you're making. Shred a bowlful and be prepared to shred more, if needed. Place an elongated, inflated balloon on a flat surface covered by an old towel. Dip, a piece at a time, shredded newspaper pieces into the liquid fabric starch and stick the wet paper to the balloon. Cover the balloon. Form a banana stem by adding layers and shaping the wet newspaper like one would shape clay or play dough, until a stem is achieved. You will need many layers to build up the necessary bulk. Add more liquid starch with your hand if you need to make the newspaper more pliable. Allow to dry. Paint the fruit/vegetables according to how they should look, using the paints and paintbrushes. Cut carrot tops from tissue paper, creating a tube with the tissue paper, taping one end, and the shredding the top to resemble "greens." Glue with the glue gun to the top of the carrot.